Everyone agrees the social care system is out-of-date. When it was created after the Second World War under the 1948 National Assistance Act the idea was to create a safety net for the most vulnerable in society. But the support was only ever meant to be short-term. Back in the late 1940s people tended to only live a few years after retiring. Now the situation is very different. Many live for 20 years after stopping work and children born today will probably spend a third of their life in retirement. Granted, advances in medicine mean people are living for longer in relatively good health. But that does not mean they will not need some help with basic tasks like washing, dressing and eating. 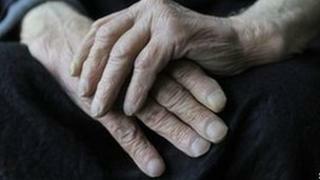 Research suggests three quarters of people over the age of 65 still develop a care need. Similar patterns have emerged for people with disabilities. For example, even 30 years ago many people with Down's syndrome died before they were 25. Sixty is not uncommon now. Unsurprisingly the effect of people living longer has been to put the social care system under greater strain. Concerns have been raised about the quality of services people have been receiving. A report last year by the Equality and Human Rights Commission described cases of people being left in bed for 17 hours or more between care visits and a failure to wash people regularly. But those are the "lucky" ones who get help at all. Councils are increasingly having to ration access to state-funded support. Six years ago half of councils provided help to those with moderate needs, but that has now fallen to less than a fifth. It means in most areas of England support is only provided to those with the most acute problems - effectively people who need help throughout the day. In reality, the system has been rationed as much as it can be. The situation has been further exacerbated by the feeling of unfairness that has been associated with people having to sell their homes. The rise in the value of property over the past few decades has pushed many above the means-tested threshold, forcing them to pay for their care if they have to go into a residential home. For some - an estimated 50,000 a year - the only option is to relinquish the family home. But if that is not enough, the problem is about to get much worse. As is the case with NHS reform, the ageing population demands that new solutions are found. The baby boomer generation is approaching old age - and that means a tidal wave of new people who will need help. Over the next 20 years the number of over 70-year-olds will jump by 50% in the next 20 years to top 9.6m, according to the Office for National Statistics. Without radical change, many believe the safety net created all those years ago will break.